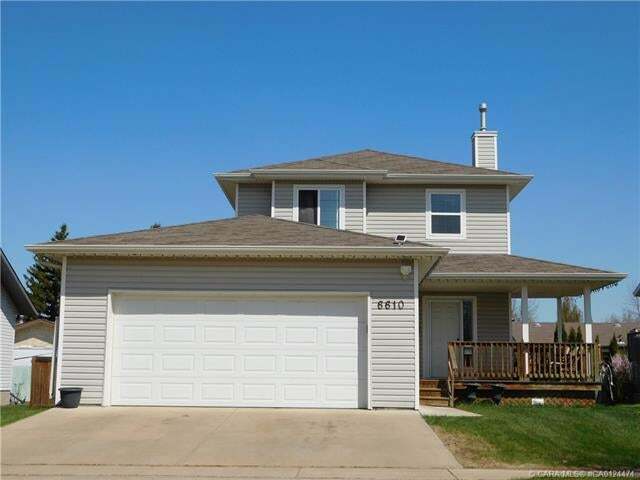 Excellent 2-Storey in the desirable neighborhood of Century Meadows! Wonderful 4bed/4bath family home on a quiet cul-de-sac near playgrounds, parks, Church, and walking trails. You will treasure the bright & inviting open floor plan with a lovely spacious kitchen, large island and dining space with patio doors to the exciting outdoor space with a deck and hot tub. Enjoy the cheerful great room complete with a gas F/P to create just the right mood. Main floor laundry, a powder room and attached garage access add great conveniences. Escape to calmness provided upstairs by a glorious master bedroom with an en-suite and a walk-in closet, along with two super bedrooms and a full bath. More living space is provided by the substantially completed basement offering a bedroom, bath and a sizeable L-shaped family room. You are sure to value a fully fenced, landscaped large yard along with a storage shed. This nicely designed and well cared-for home is awaiting you. A fantastic opportunity!